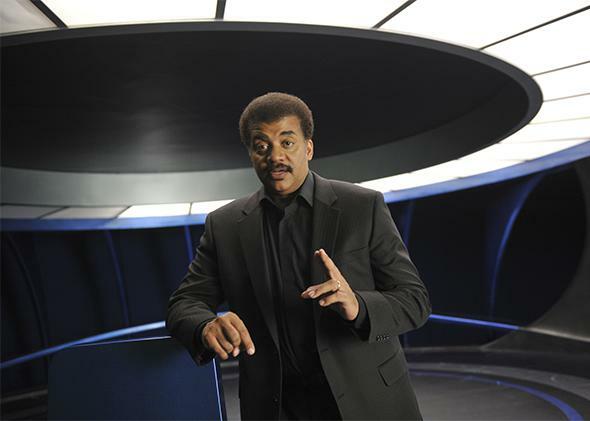 Cosmos TV review: Neil deGrasse Tyson’s Fox reboot of Carl Sagan’s miniseries tries to reconcile science and faith. The new Cosmos tries to reconcile science and faith. Neil deGrasse Tyson on the “Ship of the Imagination” in an episode of the new Cosmos. How big is the cosmos? This is both a central question of Cosmos, the Seth MacFarlane–produced, Neil deGrasse Tyson-hosted reboot of Carl Sagan’s widely watched and beloved 1980 miniseries investigating and elucidating our knowledge about the universe, and a question of Fox’s, which is premiering the new version on all 10 of its channels this Sunday night, in hopes that an educational program about stars, history, evolution, and the universe can once again become a zeitgeist-capturing, hugely-rated television event. Will Americans still be delighted to eat our science vegetables if they are sprinkled with enough stardust? Fox is hoping yes. The new Cosmos starts slowly and reverently enough: deGrasse Tyson, a warm, avuncular presence, standing on the same cliffs Sagan did, talking about the universe, our place in it, and preaching the gospel of the scientific method in a glossy episode, which, scientifically speaking, doesn’t advance much beyond middle school. But though Cosmos hews to many of the conceits deployed in the original—the “Ship of the Imagination” is back, as is the calendar compressing the 13.8-billion-year lifespan of the universe into just one year, not to mention the humorless pronunciation of Uranus as YUR-anis—things have changed, and not just because Pluto is no longer a planet. In 34 years, scientists have made significant advances, as have special effects departments (the Ship of Imagination is newly sleek), but the most notable change is how politicized science and scientific thought have become. The first episode of Cosmos devotes a good chunk of itself to an animated sequence about a Franciscan monk living in 16th-century Italy who was burned at the stake for his scientifically correct beliefs. It is a segment aimed squarely at anti-science advocates, implicitly arguing that science and the scientific method are not necessarily inimical to god. DeGrasse Tyson, walking the streets of Rome, relays the story of that monk, whose name was Giordano Bruno. (Though he lived between Copernicus and Galileo, these more famous men each barely get name-checked.) Bruno had a dream not just that the Earth wasn’t the center of the universe, per Copernicus, but that neither was the sun: Instead, the universe was limitless. Bruno was not a scientist. He did not test his hypothesis. His insight came to him as a revelation, one he kept preaching even as he was excommunicated and banished from every church—Catholic, Protestant, and Calvinist—in the land (as well as being laughed out of Cambridge). In Cosmos’ version of Bruno’s story, organized religion, and the Catholic Church in particular, are presented as rigid and corrupt—the church is described as the “thought police” and the priest who sentences Bruno to death looks like a very nefarious Disney villain—but faith itself is not. Bruno’s argument is that his god is limitless and unbounded, so why shouldn’t the universe be? “Your god is too small!” he cries to those who brand him a heretic. Writing in New York magazine, Matt Zoller Seitz interpreted this segment of Cosmos as “painting organized religion as an irrelevant and intellectually discredited means of understanding factual reality” and as part of the show’s larger “pushback against faith’s encroachments on the intellectual terrain of science.” (This is particularly in contrast to the sort of echt-spirituality and new-ageism that hovered around the original Cosmos. Sagan himself was agnostic.) Organized religion certainly comes in for it, but I think this segment is up to something more gentle than declaring war on blinkered anti-science evangelists. Cosmos is offering viewers a way to reconcile science and faith: Don’t let your god be too small. I doubt very much that the mini-bio of Giordano Bruno will prove effective at convincing creationists that Cosmos is for them. Cosmos is unapologetic about its faith in science: “Science gives us the power to see what vision cannot,” deGrasse Tyson says. In one segment, he points out that if you compress the history of the universe to one year, then Jesus and the religion he inspired have existed for all of five seconds. But just the simple fact that nearly a quarter of Cosmos’ first episode is devoted to an allegory about a relatively marginal Franciscan monk, rather than science itself, shows how extensively anti-science activists have hijacked the conversation, and just how seriously Cosmos takes that hijacking. Cosmos is trying to encourage all remotely reasonable people, god-fearing or otherwise, to look up at the stars.